“No foot, no horse.” Anyone who has owned a horse has heard it hundreds of times. Numerous competition or riding days are lost due to problems associated with hoof condition but few equestrians understand what is needed to promote hoof health. You can apply all the hoof dressing you want but if your horse isn’t getting the nutrients he needs, you may as well paint his hooves with cement. Nutritional factors play a huge role in hoof health. Without proper nourishment, horses tend to have poor hooves and coat condition because of the deficiencies within the body. It is vital that nutrients are not only present in the horse’s the horse’s system to use. On the most basic level, horses need good-quality protein for hoof soundness. Protein delivers essential amino acids that hooves need, such as methionine and lysine. In order to grow properly at the cellular level, the hoof requires a precise supply of important nutrients, including water, energy, protein, calcium, zinc, manganese, selenium, copper, vitamin A, vitamin E and biotin. Copper, zinc and manganese are the main microminerals that have an important role in hoof growth and quality. Horses turned out on forage alone may be low in zinc and copper. Similarly, horses that are stabled and fed conserved forage may not be ingesting enough of these important microminerals. Zinc is perhaps the most important for hoof growth, as it is required for cell reproduction and repair of epilethelial tissue. It is also needed to make collagen and keratins through enzymes, which help produce the structural tissue of the hoof. Many horses with poor hoof quality have been found by researchers to have suboptimal zinc content of the hoof. Copper is also important for its role in an enzyme that builds disulphide bonds in keratin, providing strength to the hoof wall. It is also needed for cross-linkages in collagen (dermis) and elastin (blood vessels).In addition, manganese is required for internal structures within the hoof capsule such as joint cartilage synthesis and elastic connective tissue. With the myriad of equine feed products and supplements on the market, how can you find which is best for your horse’s needs? Sometimes it’s as simple as reading the label on your feed bag. Bioplex® organic trace minerals, an Alltech product, are included in many premium horse feeds and supplements. They may also be purchased as a top-dressed product. Bioplex minerals help dissipate problems associated with mineral interactions leading to impaired absorption in the horse’s digestive tract. They help deliver microminerals, improve trace mineral levels, and minimize problems associated with mineral interactions that can impair absorption in the digestive tract. Research has shown that feeding Bioplex organic trace minerals aids hoof growth and quality, compared with inorganic forms. In one study, researchers fed inorganic zinc and copper to some yearling geldings and gave the same minerals in Bioplex organic form to others. Those that received zinc and copper with 45 percent from Bioplex showed a significantly higher daily balance of these minerals compared with the same quantity in inorganic form. Bioplex is among the ingredients contained in Alltech's Lifeforce, a supplement designed to promote overall equine health and condition. Many owners of horses with hoof issues have found Lifeforce beneficial. Karen Stone, who imports and sells competition dressage and event horses at Stone Ranch in Los Angeles, California, says she recently used Lifeforce on a FEI-level dressage horse. His hooves were not growing well and tests showed that his protein levels were low. This was a major concern, as the horse had once suffered from laminitis. 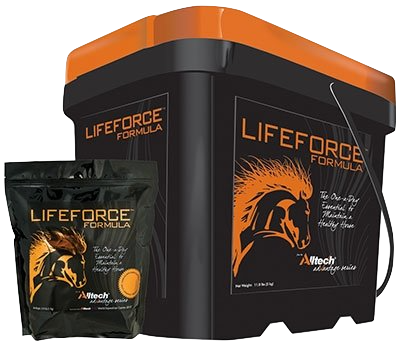 After trying a number of products without success, Stone obtained a 30-day supply of Alltech’s Lifeforce. “I was rather skeptical that any product could work that quickly,” she said. But within a few weeks, she noticed that the horse began to look like himself again. He was retested and his protein levels were within normal range. “My farrier commented on the remarkable hoof growth. He had never seen anything like it,” she said. Lifeforce and Bioplex contain chelated (organic) minerals. The process of chelation increases mineral availability to the horse, as they are more easily absorbed from the digestive tract. Amino acids and peptides are efficiently digested by enzymes in the horse’s small intestine, helping “smuggle” the attached minerals across the intestinal barrier. Research has shown that chelated zinc, manganese and copper are 20 to 75 percent more available than the inorganic forms added to many non- premium horse feed and supplements. While not all microminerals can be chelated, copper, manganese and zinc are available in organic forms. The benefits of feeding organic trace minerals are not simply related to improved absorption. There are also significant advantages related to the amino acid or peptide itself used to chelated the mineral. This may help target specific metabolic functions, thereby providing nutritional support for immunity, performance (athletic and reproductive), and of course hoof and hair growth. Dit artikel is overgenomen uit Equine Internation, verschenen het maartnummer 2011 door Alltech. Auteur: Steven A. Elliot. Mijn paard heeft last van Staart en maneneczeem. Wat moet ik doen? Welke vitamine-mineralenmix heb ik nodig voor mijn sportpaard? Heermoes, is dat niet giftig voor paarden?